When it’s time to go guitar shopping for a child, parents are often confused about what to buy. This is a guide for how to save money and make sure that your child enjoys his or her time on the guitar. I recommend printing this list and bringing it to the store with you. If you can’t buy a guitar before your lesson, it doesn’t matter, because I have a ton of awesome guitars that you are welcome to use! Buy the child a small, very inexpensive acoustic guitar, ukulele, or other instrument of deadly unintonated cacophony, and let them pound away at it, making noise. If you’re in Portland Oregon, I recommend signing the child up for Music Together: inexpensive group kids’ music classes at Community Music Center on SE Francis and 33rd in Portland Oregon. I wouldn’t spend time on private lessons until the age of 6. Joy in music is important. Do not expect much of the kid with practice at this time. PROS: Cheap, easy to buy, no hassle in the store, so things “seem” okay at first purchase. CONS: Much, much harder to play. Much less cool sounds. Kids tend to give up more easily when their instrument is an inexpensive acoustic guitar. You’ll end up replacing it anyway down the road. Kids will be very impressed by my electric guitars and their weird sounds. Inexpensive acoustic guitars are just about the most physically difficult situation a beginner could be placed in. MODELS: BABY TAYLOR, MARTIN BACKPACKER, TAYLOR MINI, AND CORT, EPIPHONE, AND OTHER LOW-END MODELS. PROS: Super easy to play! Inexpensive. The electric guitar can make weird sounds, and kids love cacophony. CONS: He/she will outgrow it. I do not generally recommend child size electric guitars. They have loads and loads of problems, including staying in tune. However, if price is a serious issue, take this option. Just remember that these packages are often new, and the guitar and amp that you just bought for $200 decrease in resale value by about $125 or more as soon as you leave the store. If you went to Guitar Center to buy this package, the price you’ll pay for these packages also goes to corporations that don’t support local musicians. You’ll also get terrible customer service, and chances are, that Guitar Center deal you got doesn’t include the guitar being intonated, so it won’t play in tune, so you’ll need to take it to another repair shop and spend more money and time. MODELS: SQUIER, FENDER, EPIPHONE AND OTHER LOW-END MODELS. PROS: Super easy to play! Inexpensive. The electric guitar can make weird sounds, and kids love cacophony. The child will never outgrow it. It will not have intonation “tuning” issues like the smaller guitars do. The resale value will be great, because you bought used. CONS: You’ll spend $50-$100 more at the beginning. The child may simply be too small for the guitar (but this usually changes in about 2 months). Thankfully, Trade Up Music has a great refund policy and you can get another instrument at Trade Up for the same value within 1 week. MODELS: YOU ARE NOT LIMITED. SINCE YOU’RE BUYING USED, YOU CAN GET A QUALITY INSTRUMENT AND BRAND. ASK THE STORE EMPLOYEES TO HELP YOU. I get a the occasional email or phone call from other music teachers, requesting information on how to teach music and run a music lesson business. I’ve received these kinds of calls for years and I’ve finally implemented a solution. Consulting for Music Instructors. Click here to pre-purchase a consultation session. I’ll be contacting you by phone or email to schedule a session, you can also Schedule Online for Free. Students generally visit my studio in inner SE PDX on SE Division and 12th. In addition, I have a recording studio at a separate facility with isolation booths, control bay with window, headphone mixes, and vaulted ceilings, a decent ProTools project studio. What kind of strings should I buy for my electric guitar? What strings should you buy for your guitar? This is the “thickness” or diameter of the strings. Musicians refer to guitar strings by the gauge of the high E string. A “set of 10’s” is lighter (smaller in diameter) than “a set of 12’s.” String gauge varies widely. You need to consider your guitar’s scale length before you choose strings. If you’re a geek, click here for more about scale length. Otherwise, it just basically means, length of the string, and you can read on. Short scale guitars are easier to play. Use heavier strings for thicker tone. Here are some short scale guitar manufacturers and models. Long scale guitars are harder to play. Use lighter strings in general. Here are some long scale guitar manufacturers and models. Remember, the long scale makes it more difficult to play, but also produces a different frequency and/or signal quality due to the extra length in scale. Why is this? Well, think about a ukulele, and then think about a guitar. Now think about a bass guitar. Now, think about a cello. Is a cello larger than a ukulele? Yes, it certainly is. Transitively, a bass guitar is larger than a guitar, and a guitar is larger than a cello. A cello makes lower sounds than a ukulele or a guitar, right? Yes, that’s definitely true! So every time you think of “long scale,” think of a “longer neck” and “deeper sounding tones.” Bass frequencies oscillate at a much lower rate. This means that the waves are longer. Without getting too much into physics, I will leave it at this: longer scale guitars are harder to play, but often can produce deeper sounding tones with more clarity. Lighter strings = lighter tone (generally). Best for more finesse players. Heavy strings = bolder tone/harder to play (usually). Better for heavy hitters. Don’t know? Ask your luthier or guitar shop. A reputable shop will know. Click here for Portland Oregon shops I recommend. As far as I can tell, most luthiers measure from the nut to the center of the 12th fret and double that measurement for the “scale length.” The only thing is that it doesn’t seem to fit a lot of manufacturers’ stated specifications if you do it that way. I like to measure to the 12th, double that distance, and call that the scale length, just to be consistent. Then, adding compensation for various strings, I’ll call each of those lengths “compensated scale length.” That way, at least I don’t go crazy right off. Now, just to drive us all nuts, some builders shorten the distance between the nut and first fret to improve intonation in low positions. That, of course, messes with our ability to measure the scale length on a given instrument. 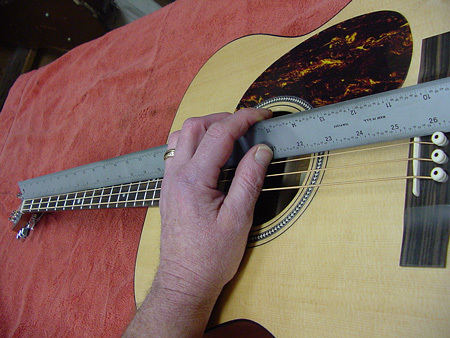 Precise measurements are critical in building an instrument, but for the practical purposes of comparing instruments as to their tone and performance, approximate measure is just fine. I don’t think 1/8″ one way or the other will have much effect. I was trained in these matters by Chris Brandt, owner of the 12th Fret Custom Guitar Shop in Portland, when I worked there for about 3 years. Not only are they a great bunch of guys, but they are very knowledgeable luthiers, and kind individuals as well. They do everything from string changes, to refrets, to steaming apart necks of old Martin guitars and doing who-knows-what in there. Saul Koll of Koll Guitars, also used to work there and Saul is an amazing luthier as well (and a fabulous electric guitar player). The 12th Fret is a little shop who does repairs for the likes of Robert Cray, and Saul builds guitars for Sonic Youth. I think I was taught by the best (or close to it). Since I didn’t know the scale length of Parker Fly guitars, I googled it. I found out that the scale of the parker fly has a 25.5″ scale. This is a long scale. So my student should use lighter strings. I have taught this particular student for quite a few years, and he’s more of a delicate technician than a heavy hitter. Light strings work best for players who are more finesse focused. Hard and heavy hitters, use heavy strings. And remember, if you’re having issues with buzzing strings, make sure not to hit your guitar too hard! That “buzzing” sound comes from the string whacking against the frets. The force you use with your pick, as well as the angle of the pick, all comes into play. Before you take your guitar in to be repaired, take a lesson or two with a good instructor to verify your technique isn’t causing the problems. Rock on and good luck!